Italian painter, engraver and architect, his name also spelled Carlevarijs. 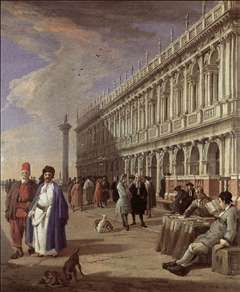 He is regarded as the father of 18th-century Venetian view-painting (veduta), for although he was not (as sometimes asserted) the first to specialize in the genre, he approached it with a new seriousness, his training as a mathematician being reflected in his rigorous perspective settings. Carlevaris s artistic inclinations were probably inherited from his father, a painter and designer who died when his son was very young. In 1679 Carlevaris moved from Udine to Venice and was discovered by the aristocratic Zenobio family, whose palace was near where he lived. He soon entered the service of the Zenobio family, painting large landscapes for their palazzo beyond Santa Maria del Carmine between 1682 and 1688. These works reveal the influence of Eismann, as well as of Pieter Mulier, called Tempesta, who was active in Venice during that period. As a token of his position as pittore di casa Carlevaris retained the sobriquet Luca da Ca Zenobio . Carlevaris s important series of one hundred and four etchings, published under the title Le Fabriche, e vedute di Venetia, dates from 1703. This collection of predominantly frontal views of the most important buildings and squares of Venice form the first series of Venetian vedute conceived as a whole. 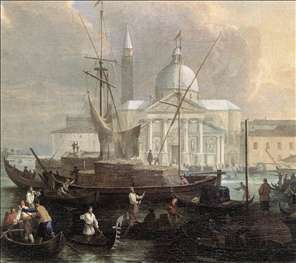 Though Visentini, Canaletto and Marieschi among others followed in his footsteps, they never produced prints on such a large scale. 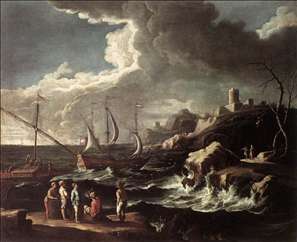 Few works by Carlevaris can be dated with any certainty prior to 1703. 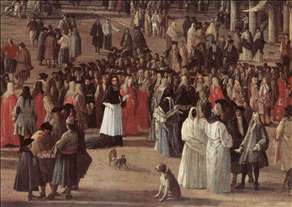 His main output before that date probably consisted of capricci and landscapes, with the notable exception of the Reception of Cardinal Csar d Estres (Rijksmuseum, Amsterdam) which, if it was executed in 1701, was his earliest veduta. Carlevaris s first vedute painted after 1703 can be dated 1707, when he again recorded a number of diplomatic receptions. He also finished his first documented commission that year, which he had received from Stefano Conti from Lucca. 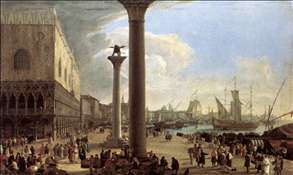 His paintings, and his set of over 100 engraved views of the city published in 1703, are the foundation on which Canaletto and Guardi built. 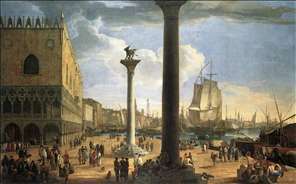 It was the most complete survey of the fabric of the city ever produced and served as a model for Venetian view painters throughout the 18th century. 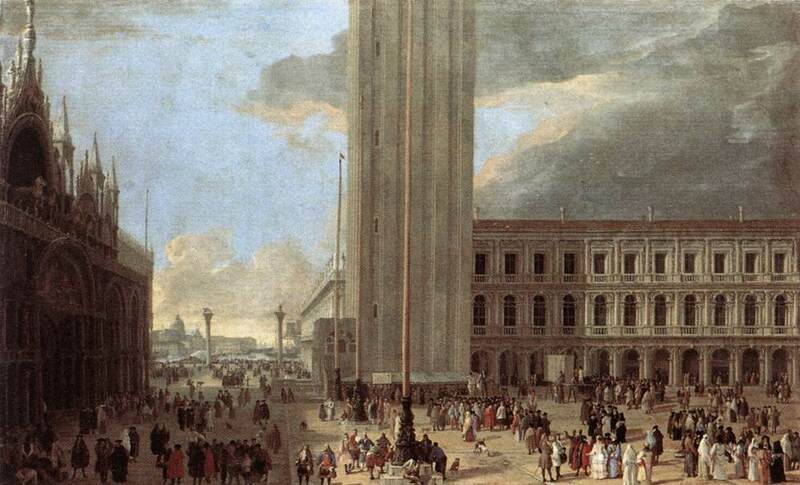 Though Canaletto is said to have studied with him, Carlevaris had only one true student and follower, the little-known Swedish painter Johan Richter, who worked in Venice from 1717 until his death in 1745. 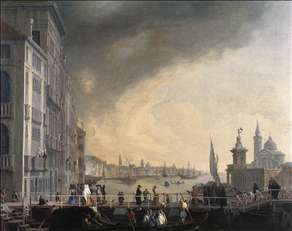 Carlevaris s influence on both Canaletto and later vedutisti is undeniable, however. See more details about "Seascape"
See more details about "The Sea Custom House with San Giorgio Maggiore"
See more details about "The Sea Custom House with San Giorgio Maggiore "
See more details about "The Reception of Cardinal César d'Estrées"
See more details about "The Reception of Cardinal César d'Estrées "
See more details about "Piazza San Marco with Jugglers"
See more details about "The Piazzetta and the Library"
See more details about "The Wharf, Looking toward the Doge's Palace"
See more details about "The Molo with the Ducal Palace"
See more details about "The Bridge for the Feast of the Madonna della Salute"